A delegation from Larissa (Greece) headed by Vice Mayor Mr. Georgios Soultis traveled to Lima (Peru) earlier this year to meet representatives of the municipality of Miraflores as part of their IUC cooperation. The one week visit gave Miraflores the opportunity to show the delegation their work in a range of sustainable development fields, such as renewable energy, public space and green areas, urban mobility and climate change mitigation. The Mayor of Miraflores, Luís Molina, received the delegation of Larissa in the municipal palace. Here a letter of commitment was ratified laying the foundations for future collaboration between the two cities. During the mission, a visit was undertaken to the Costa Verde urban project, in which land reclaimed from the sea was adapted for the construction of gardens, public pools, tennis courts and playgrounds for children. Delegates also learned more about a project to recover buildings of historical value, as well as an underground store of energy that will serve the population in the case of a natural disaster. Miraflores additionally outlined its urban mobility plan, sharing a presentation of good practices. To discuss the next steps, both delegations met at the Ricardo Palma Municipal Library, where they identified which projects can be jointly executed in the coming months. Following the visit, it is expected that the cooperation terms between both territories, the staff involved, and the steps to be taken will be finalised. 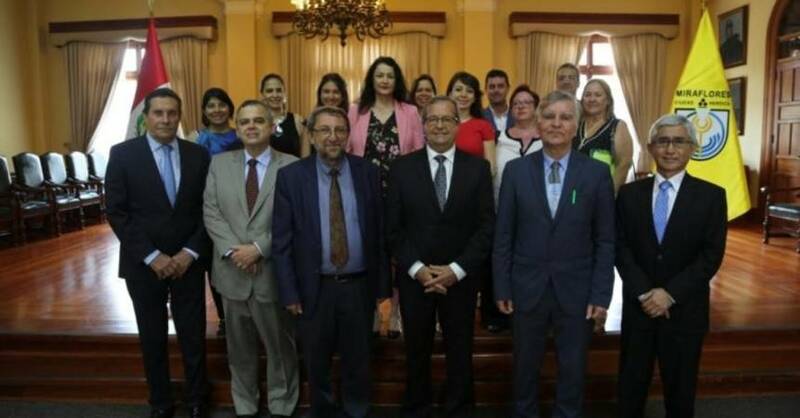 In June, it is foreseen that a delegation from Miraflores will travel to Larissa.